Are you passionate about coding? Do you get excited about developing concepts into client-oriented products, with the use of innovative technologies and lean / agile methodologies? Then we are looking for you! Since its inception in 2011, Quasset has set out to push the frontiers of Asset Management and Condition Assessment. With an in-house international multidisciplinary team of experts complemented by a large partner network of leading organisations, Quasset excels in bringing together expertise from different fields to provide innovative solutions. Quasset supports clients in optimizing the balance between cost, performance and risks of capital-intensive infrastructure such as water distribution systems, roads, pipelines, and petrochemical plants, developing inventive products for asset management information and business intelligence using GIS, 3D, virtual, and augmented reality technologies. 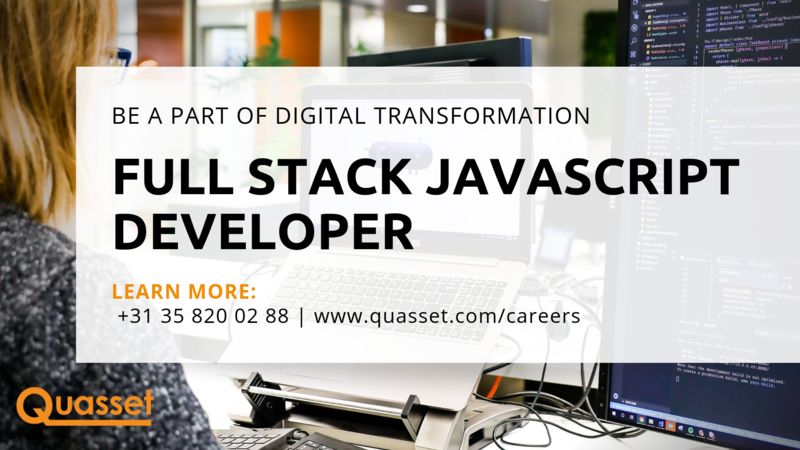 With a clear focus on the client, you work on advanced web applications using modern software technologies like Node.js, React and React-Native. You love solving coding challenges, learn and adopt modern technologies and are passionate about taking a product from concept to client. Lean / agile, of course. We give you the freedom to take initiative and fully support your personal growth and development. Contributing to functional and technical design and development of well-structured software products Contribute to maintenance of existing code bases. Please send your application including your CV by email to careers@quasset.com, Attn. drs. Luc Stakenborg, CTO.